1bedroom w/2 full-sized bed. 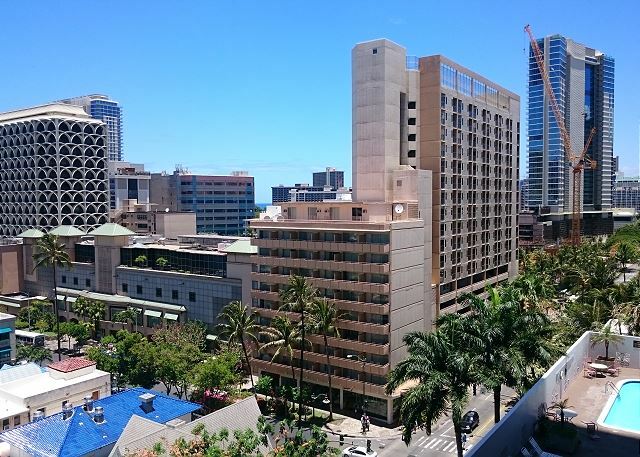 Just 2 blocks to the world famous Waikiki beach! 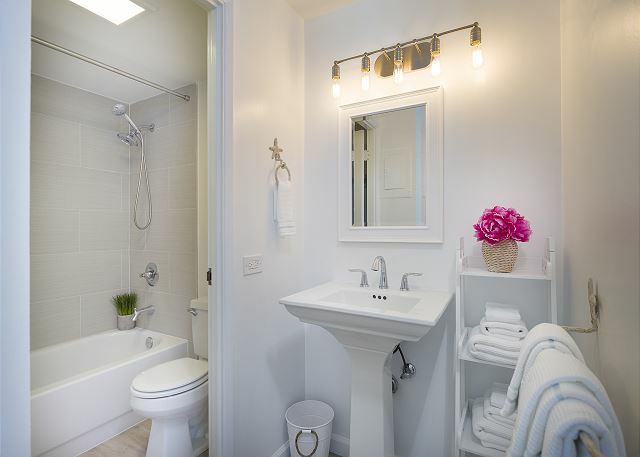 Amazing clean 1 bedroom! 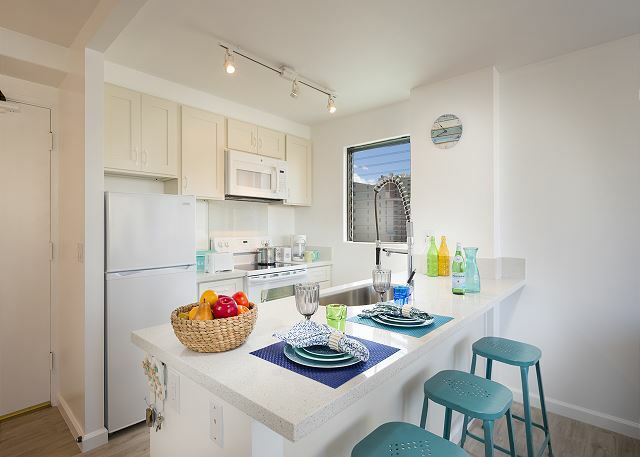 Nicely upgraded with new furniture and fully furnished for your Hawaii vacation! 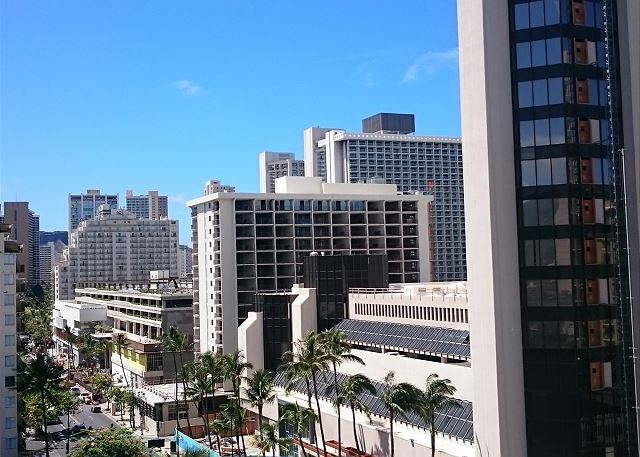 The building is located in the center of Waikiki and so convenient for shopping, dining, beach-going... everything that Waikiki offers! There are tons of activities on property including swimming pool, ping pong, pool tables, pool side exercise room, basketball, BBQ, and shuffle board. Building amenities also include a FREE reserved parking, business center, and 24 hour security. 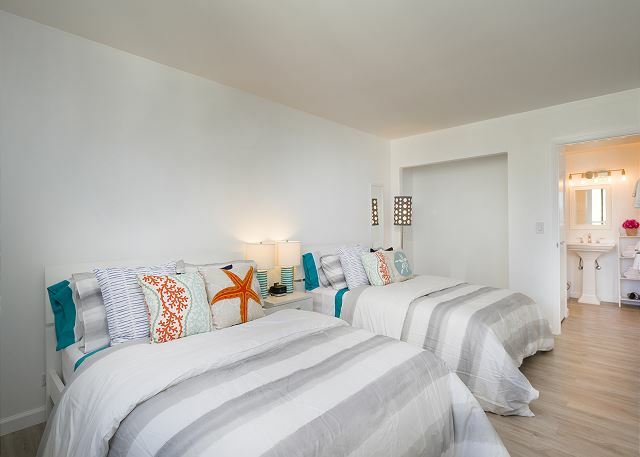 Rooms Sleeps 4, Newly Renovated 1 bedroom for Your Next Stay! Free parking! Free WiFi! Had an excellent vacation and staying at The Royal Kuhio #1008 made it even more amazing! The room that my fam stayed in was renovated.. it was very clean and there was a lot of room for the 3 of us. The kitchen, TV room/living room, bedroom and bathroom is really styled nicely. The bedroom has 2 beds which was comfortable and the bedding/comforter is very cute. There’s also a compact drying rack, hangers and lots of storage space. We appreciated all the little things included in this rental like dishes, coffee cups, dish soap, utenstila, slippers and of course the ref and freezer! Also there’s beach towels, bathroom towels, a floatie and also soap and shampoo and lotion. Tub and toilet in bathroom and sink is located outside. No problems with getting hot water. Appreciated the free parking and WiFi. There’s a security guard on site all the time. Would definitely come back. Mahalo. Well considered and clean. Good cost performance. Except for Parking place and key system. It's clean and covinient locatied. I'd like to be there again soon. We enjoyed this cute apartment. It was stylish and in a great location. Walking distance to beach, restaurants and shopping. We didnt use the kithen so I can comment on that. I did find the bed to be very uncomfortable. Extremely hard and there was a lack of extra bedding. Im glad to have only had a few days booked there, my back wouldnt have done well sleeping in those beds any longer. Great wifi too. The unit is easy to find, centrally located and within walking distance of everything needed. Unit has some basics provided but more towels, kitchen supplies and food basics (salt and pepper, cooking oil, etc) would be helpful. Beds were comfortable, unit was clean and modern and the AC worked like a dream. This was the perfect place for my 5 day stay in Oahu. Location = wonderful and central to Waikiki. Walking outside, there is a bus stop, and really good eatery options such as Marukame Udon, Gyu Kaku BBQ, Matcha Maiko Stand. Suffice to say, being a foodie like me, this was a really good location. Condo unit itself = very clean and had all my amenities. All pots & pans, plates, bowls, utensils were there including chopsticks. In addition, they had a rice cooker, a kettle, microwave. Bathrooms had bath towels, beach towels and even snorkeling gear (size small)! Bed super comfortable. AC was working fine throughout and the place was recently remodeled and had nice decor. Parking was free, albeit on the 6th floor which took us like 10 minutes to park each day but I'll take that since if you stayed at a hotel, you would be paying $40/per day. Laundry is on the 7th floor and you need to pay $2 to wash and $2 to dry (get quarters at the lobby). Security within condo, very safe building. 1.) One of the couches was very dirty, had stains and therefore they had a quilt over it. I would stay here again in a heartbeat. Great value! Will recommend to family and friend who will visit Oahu in the future. This place is suited for 4 people max. Would not recommend more than that unless you want someone to sleep on the sofa in the living room. We had 3 adults stay here during our visit. 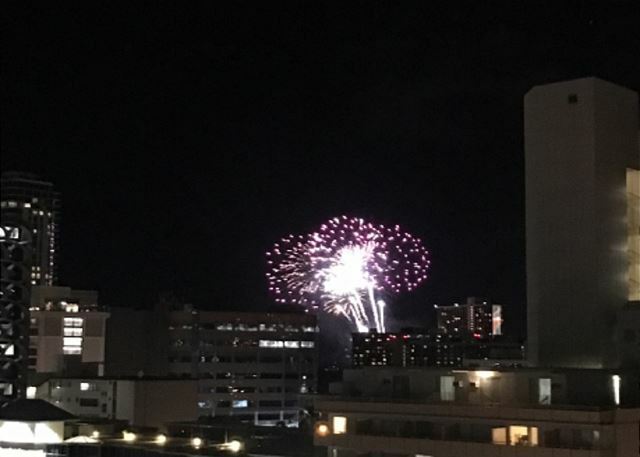 Property was great , great location right on the busy Kuhio ave in Waikiki, on the10 th floor of hotel so great view, nice pool and tennis court on 7 th floor. Only downfall we could find was lack of curtains , property only had thin curtains which allow early morning light into the rooms ( gets light about 6 ) and if you want to see tv in the arvo it’s a problem. Apart from that we enjoyed our stay. Overall our stay was excellent. The location of this condo was just right. Very convenient to get to the shopping area. Only thing i would comment is you can hear a lot of noise from down below and the elevator would sometimes take very long specially during peak hours. Great location, clean , comfortable. 5 minute walk to beach. Close to all the shopping and restaurants. You wouldn't require a car if you planned to stay in town, but does come with a free parking stall. Wifi worked great. It was simply and tastefully decorated. Overall very clean but the coach could have used a good cleaning. The only issue we really had with the place was the amount of amenities. It states suitable for 5 people which we had but only came stocked with 4 bath towels, 4 hand towels and 4 wash clothes. There were only 2 beach towels. There was enough room to sleep but not enough sheets to cover the bed convertibles or blankets. No dish towels at all to dry clean dishes, there is no dishwasher. No extras stocked in kitchen. I would recommend this condo overall but having it stocked not so sparsely would be a big improvement. This rental was exactly as seen in the pictures. It was clean and bright and the AC worked wonderfully! The building location is perfect - close to beaches, shopping, restaurants. Everything went smoothly and I highly recommend this for other! This is a nice property that looks much like the pictures that are displayed. It had nice amenities. The kitchen has everything anyone would need. There was shampoo, lotion, and a blow dryer in the bathroom. The rental was very clean. There is a partial ocean view from the balcony. You can see the ocean in between the buildings. The location is amazing. Restaurants, stores right outside the front door. Only criticism I would have is the elevator situation was horrible. There are three elevators, one was broken and all three were out of service one day of our stay. That is not the owners fault and they have no control over that, but it was a pain. And the sofa in the living room could use a cleaning. Other than that, would recommend and had a very enjoyable stay. our room was nice and clean and worked out very well for us, every thing works and it had everything we needed, all i all very good, kj. Great place with plenty of room. Walking is distance to shops is just 2 blocks away, with plenty of food options. Everything is clean. The apartment is very bright which I really love. The owner is very thoughtful, he prepared everything that we needed, including umbrellas which we used during the storm and we did not prepare for this trip. There were tiny ants in the suite mainly in the kitchen area, but I expect that all the apartments in the area have the same issue. Not a big deal. Location is awesome! It is located near shopping centers, high rating restaurant, duty free and more. Admin staff was easy to contact but are not onsite, you basically are on your own. However, it was easy to find your way around and instructions are in your email and in binder in room. One dedicated parking spot which is nice. The place has modern design, clean and had most the items you need to stay for a while. Free gym and pool access nice. The hotel is close to almost everything and you can walk everywhere. 1008 us a corner space so have more privacy. Free in room wifi is password protected. Only negative thing I have is the parking lot is tiny and could be difficult to drive through with a big car, but the parking spot is large enough for it. You also have to return a key to the outside lock box which makes it difficult when checking out since you need the key to get to the parking lot. Overall, it was great with 4 people and a baby. 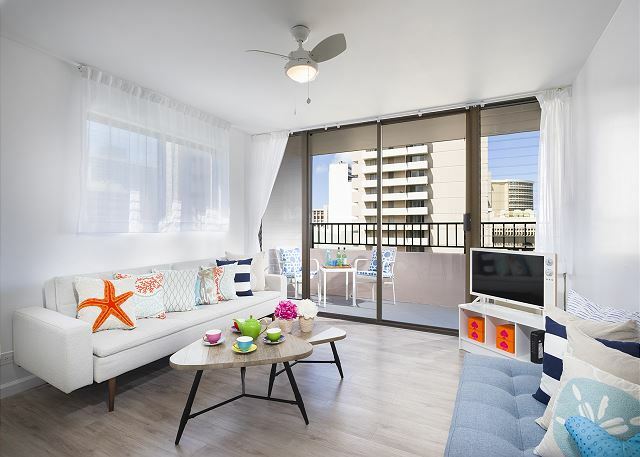 We stayed here with our family of 5 and it was the perfect little unit for our stay in Waikiki. The unit was beautifully decorated, clean and had everything we would need. 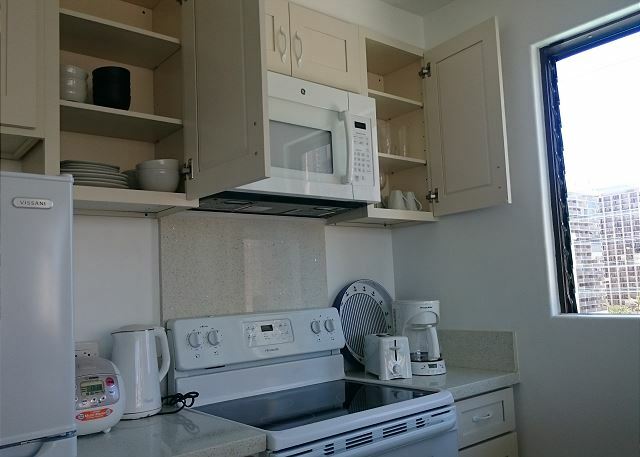 Great location, easy walking distance to the beach, very clean, comfortable beds, exactly as described! Parking, pool, air conditioning and wifi included! Fit our family of five just fine. Lived in HI 22 years prior and knew where we wanted to be to enjoy Waikiki. This place was perfect. Would definitely stay there again. Location is fantastic for getting to all parts of Waikiki. The building was always very clean and tidy but a little outdated in the halls- could do with a freshen up. The apartment itself was immaculate with all the items you need. Curtains on the windows are just silly. They do not block out any light or daytime heat so be prepared to be awake very early. The traffic noise at night is horrendous. We had the clunky air cons running at night to drown out the sirens, cars and late night drinkers arguing on the streets below. The bus stop right out front is good for picking up the trolleys etc but beware at night- it's really dodgy. Make sure you have all your check-in emails from the realtor- we didn't receive all of ours and check-in was very difficult. The staff in the foyer will NOT help you at all. 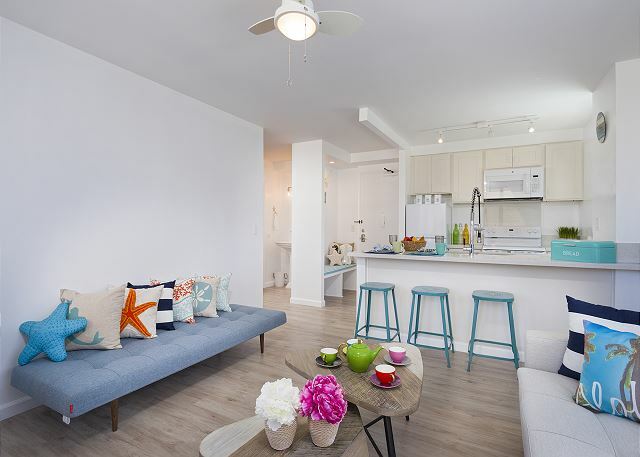 Overall, it's a great location to all the shops, restaurants and a quick walk to the beach. The apartment itself was great for our family of 5. Great experience, strongly recommend it! The location of the apartment is amazing, the owners are really nice and the conditions are great. If you are looking to spend some time in Oahu, this is definitely the place to stay. Ausreichend für 2 Erwachsene und 2 Kinder, normal ausgestattet, Klimaanlage hat gut funktioniert, Privater Parkplatz ist sehr praktisch, sauber, gutes Preis-/Leistungsverhältnis. Poolarea ist wenig genutzt und nicht sehr einladend.